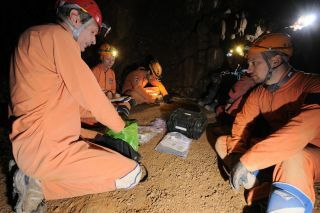 An archival picture of a CAVES (Cooperative Adventure for Valuing and Exercising human behaviour and performance Skills) expedition in Sardinia, Italy. Five astronauts are going underground to figure out better ways to live and work in space. The European Space Agency's CAVES exploration course, which helps astronauts and support staff prepare for the rigors of a space mission, kicked off this week in Italy. CAVES — short for Cooperative Adventure for Valuing and Exercising human behavior and performance Skills — sends crewmembers into a cavern called Sa Grutta on the island of Sardinia. While the "cavenauts" will enter Sa Grutta for a six-day stay on Friday (Sept. 12), their training for this simulated exploration mission began Monday (Sept. 8). Isolated environments such as caves, remote Arctic areas and underwater environments are commonly used to get astronauts used to the challenges of space missions. This year, the cavenauts plan to make their activities parallel those aboard the International Space Station as closely as possible. Procedures will have the same terminology, standards and formats that astronauts use on a real space mission, researchers said. One major goal is to reduce how much training astronauts need to participate in CAVES. "Cavenauts will need to rely on a mobile underground communication system, and on daily mission logs sent back to the ‘ground’ team," CAVES project manager Loredana Bessone said in a statement. A shaft of sunlight shines on a past CAVES (Cooperative Adventure for Valuing and Exercising human behaviour and performance Skills) expedition underground in Sardinia, Italy. "Last year’s team pushed their exploration further than ever before," Bessone added. "This year, the team will need to set up an advanced exploration camp, out of reach of their base campsite and its communication system." The astronauts also plan to test tablets to collect and synchronize data, which was also done this summer as part of the underwater NASA Extreme Environment Mission Operations (NEEMO) expeditionin the Aquarius lab, on the seabed off the coast of Key Largo, Fla.
Five astronauts, including three spaceflight veterans, will take part in this year's CAVES expedition. The European Space Agency's Luca Parmitano and cosmonaut Alexander Misurkin will have an underground reunion after spending part of last year aboard the International Space Station. Joining them will be three-flight veteran Michael Fossum (NASA) and rookies Scott Tingle (NASA) and Sergey Kud-Sverchkov, a Russian cosmonaut.